Guided missiles are an integral part of modern aerial warfare. In the last three decades, a profusion of types and classes of missile has emerged, with diverse airframes, guidance and propulsion. Air-Air Missiles (AAM) and Surface-Air missiles (SAM) were once seen as omnipotent weapons sweeping the manned combat aircraft from the skies (or so thought the authors of a certain MoD White Paper...). Reality has certainly helped to sober some of the most zealous supporters of guided missiles, with many physical demonstrations of the various limitations which are inherent in the physics of the respective airframes, powerplants and guidance systems. AAMs and SAMs can be most effective if used appropriately, conversely failure to account for known limitations can render their application quite futile. One only needs to look at the various Harrier vs Mirage engagements during the Falklands conflict, or earlier, the 1981 shootout between USN F-14A Tomcats and Gaddafi's Su-22 Fitters. A good knowledge of a weapon's capabilities and how to deal with them has an enormous impact on combat effectiveness, as demonstrated repeatedly since the air battles of Rolling Thunder were fought over Hanoi and Haiphong. SAMs and AAMs have improved remarkably since, the AIM-9 illustrating this well with a kill probability (P[k]) of about 15% for early sixties models which has improved to about 60% in the AIM-9L used in the South Atlantic . Certainly a missile has yet to be built with a 100% kill probability, therefore clever exploit ation of the inherent weaknesses of any particular class of contemporary weapon may well serve to defeat it. Each and every missile type has its fundamental weaknesses and though some may be kept secret, many can be easily inferred by observation. Propulsion is one of the very apparent limitations of any missile. Most current missiles employ rocket propulsion which offers a high thrust/weight ratio and small size. The typical thrust profile of such a solid propellant rocket is that of an initial high impulse burn to accelerate up to cruise speed, then followed by a slower sustainer burn. Once the propellant is burned out, the airframe will coast until drag takes its toll. The manoeuvring ability of such a missile depends critically on its speed and therefore the amount of wing and body lift it can generate. Immediately after launch the missile has poor manoeuvrability due to its low speed, this improves as its cruise speed is reached. Manoeuvrability will peak at the instant when the sustainer is about to burn out as the weapon has its lowest mass and a high energy state while still possessing powerplant thrust. After sustainer burnout, the missile will bleed off its energy which reduces its ability to follow through manoeuvres. Significantly, a missile's range depends on altitude, with a typical factor of two improvement between sea level and 20,000ft. Another important aspect of a missile powerplant is its visual signature of smoke plume and/or contrail. These identify the launch site/vehicle's position and aspect, may identify the missile type and also provide a clear indication of the missile's flightpath. Although modern weapons such as AMRAAM have reduced trails, it is a factor which is difficult to eliminate. The airframe and controls of a missile impose structural and aerodynamic performance limitations. Ideally, a missile airframe will employ a combination of wing and body lift to provide maximum turn rate with minimum energy bleed throughout all phases of its flight while maximising range. Most missile airframes use, much like fixed wing aircraft, indirect control forces to turn; rotating control surfaces change the attitude of the vehicle relative to the airflow which generates wing and body lift forces. These turn the missile and are proportional to speed. Even at the missile's cruise speed basic manoeuvrability limits will exist due to the airframe's G-limit and AoA limits of its surfaces and these may be exploited in defeating it. A special class of missiles are those which employ thrust vector control and radial manoeuvring thrusters. These offer tight manoeuvring at low speeds but are unable to manoeuvre after the burnout of the sustainer or thrusters respectively. The guidance implements the fundamental control law(s) designed for the vehicle, it translates the perceived motion of the target into control commands which alter the airframe's flightpath to achieve a hit. Guidance depends very much upon the class of weapon, the major categories being Command Link, Beam Riding and Homing. Command Link is common in medium and large SAM types, particularly for midcourse guidance although often it has been used all the way when jamming has degraded terminal homing. Essentially, it involves the beaming of steering commands from the launch site/platform which is equipped with radar and/or optical tracking systems. A variation on this technique is Command-to-Line-of-Sight (CLOS) often used with point defence SAMs eg. Seawolf, Javelin, Rapier. A technique with similar qualities is Beam Riding where a missile maintains itself within a microwave or laser beam which tracks the intended target until impact. The missile employs tail sensors to sense changes in beam direction. Typical beam riders are the RBS-70 and Blowpipe Man Portable SAMs (MANPADS). Although beam riders may react more quickly than command link weapons both demand exceptionally high sustained turn rates of the missile airframe to successfully track manoeuvring or crossing targets. Both techniques tend to result in cheaper rounds and complex launchers. A more effective but also more expensive technique is Homing which falls into the categories of passive, semi-active and active. Passive homing missiles track the emissions of the target (typically heat seekers or anti-radiation missiles), semi-active systems guide onto energy reflected off the target and provided by an illuminator on the launch platform. Finally, active homing weapons illuminate and track their targets. The effectiveness of homing weapons is greatly dependent on seeker, airframe and powerplant performance. Typical homing missiles employ proportional navigation guidance which attempts to match the rate of change of the missile's flightpath direction to the rate of change of the Line-of-Sight (LOS) between the target and missile. Although it may not offer the most efficient trajectory, proportional nav is simple to implement as it doesn't require range information and also tends to tail-chase its targets which is advantageous to heat-seekers. Bullseye! 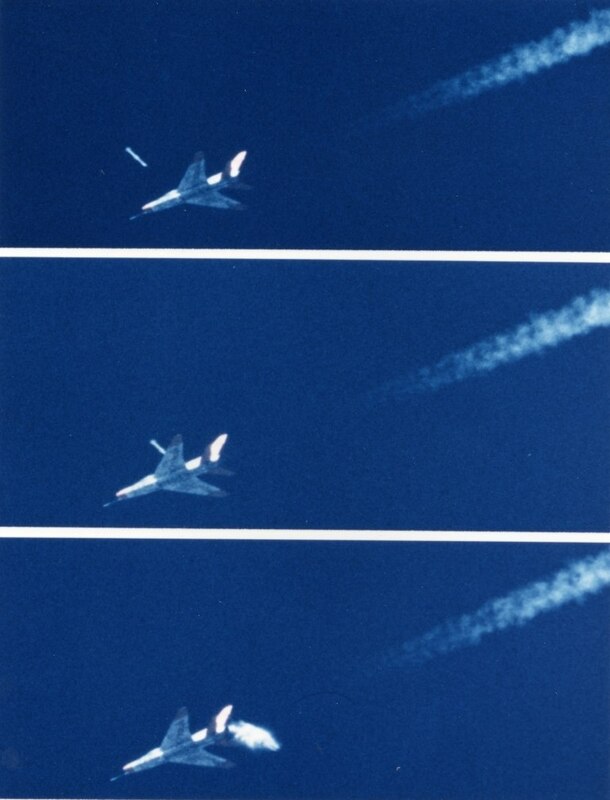 Terminal phase of an AIM-120 Amraam attack on a QF-100 simulating a MiG. Modern air-air missiles such as the Amraam are designed, at considerable expense, to counter evasive manoeuvring by targets. In live tests last October, an Amraam scored a direct hit in a fire-and-forget attack on a 5.5 G manoeuvring drone in the presence of clutter. The diversity of seeker types employed on homing missiles precludes a close look, however most of the basic limitations are common to all types, whether radar, infra-red or eg. laser. The range of a seeker will depend on its sensitivity, atmospheric attenuation, background (infra-red, laser)/clutter (radar) and the amount of energy emitted/reflected by the target. Radar seekers are least effective at low level where strong ground clutter obscures targets and powerful Doppler processing is required, best performance under these conditions is for head-on closure. Heat seekers are least effective over hot terrain and among brightly lit clouds where infra-red contrast is degraded, tail aspect launches are most successful under such conditions. From the perspective of trying to defeat homing missiles one of the most important factors is the set of limitations imposed by seeker motion limits. Every seeker has a Field-of-View (FOV) limit, a solid angle about the airframe's longitudinal axis beyond which the seeker cannot point. If a manoeuvre carries a target outside of the FOV before the airframe adjusts its direction, lock is broken and the missile defeated. Lock may however be broken earlier due to seeker tracking rate limits. To maintain LOS to a target, a seeker must slew itself relative to the airframe, which reacts relatively slowly. Given seeker design, there is some limit to the rate at which the seeker can slew while tracking the target, ie. it cannot keep up with the rate of change of the LOS to the target. This is an important limitation to a missile's ability to handle crossing targets. Other significant limitations of seekers relate to target aspect and the effect it has on the amount and direction of energy emitted/reflected by the target. Heat seekers have guided into exhaust plumes or lost lock when the target's tailpipe is obscured by the airframe (short wavelength seekers particularly). Radar seekers usually track the target centroid which varies with aspect, as the strength of the return does. Changes of aspect thus result in LOS jitter and return scintillation both of which can break lock or degrade accuracy. Given these difficulties are overcome, it is then up to the warhead and fusing to effect a kill. Warheads come in many sizes, types and configurations. Lethality is often gauged by Lethal Radius, the radius of a hypothetical sphere about the warhead within which any target will receive fatal damage. In reality, warheads are somewhat directional and therefore a lumpy lobed shape would result, or rather concentric envelopes of constant kill probability P[k] increasing as we approach the warhead (presuming that P[k] = 1 for direct impact.). Short-range AAMs have lethal radii of the order of 20-30ft, whereas large SAMs of the order of 150ft. The effectiveness of the warhead depends critically upon the performance of the fuse. The most common fuses in current use are radio-proximity and active laser fuses. An armed fuse will trigger when a target (or anything else) enters the volume of space immediately surrounding the missile. A delay to warhead detonation is usually built in to allow the lethal volume to envelop the target, although to be effective this assumes adaptive fusing. Proximity fuses can be a cause of grief to missileers as they hinder tracking of low level targets, often triggering off terrain, buildings or ship masts (and almost certainly represent the cause of most of the bomb damage sustained by Tripoli and Benghazi last April...). Given these limitations the poor performance of most AAMs and SAMs over the last few decades is understandable. The situation is improving for missile users both due to improved digital guidance/seekers and digital fire control systems, which can unambiguously recognise when a target is within the specified missile's operating envelope. Even so a launch platform must often be precisely manoeuvred to maximise the likelihood of a kill, while launching salvoes of missiles may also be carried out to maximise P[k]. Modern combat aircraft must face SAMs and AAMS in almost any scenario, whether MiG hunting or mud bashing. Significantly, Western nations rely strongly on tacair, both Close-Air Support (CAS) and deep strike playing a major role in defensive and offensive strategies. Therefore many aircraft will have to repeatedly penetrate MiG and SAM infested airspace. While ECM may be most effective, it is best used by dedicated bombers, eg. F-111, Tornado, B-1B, which have the airframe space to carry capable systems and extra crew to manage them. Air superiority aircraft and strike fighters such as the F-16, F/A-18, Lavi or A-7 have little space for ECM, a limitation exacerbated by a single person crew; the high level of automation thus required is at the expense of ECM capability, particularly the ability to jam multiple threats simultaneously. Evasive manoeuvring then becomes essential to survival. Ideally, the pilot of a penetrating aircraft should try to discourage a missile launch, if this is unsuccessful, he must then exploit every known weakness of the missile's system to defeat it. Unlike AAA, missiles are a visible threat which act on a timescale which does allow some response. When dealing with SAM sites, launches are most easily prevented by remaining outside of the known envelope of the SAM, moving fast and low and exploiting terrain to frustrate tracking. Jamming can be useful but is often futile at very close range, especially against massed SAM systems. Denying a missile launching aircraft an opportunity to shoot is more demanding and generally constitutes the defensive aspect of aerial combat, a major subject in itself. To a large degree, it will depend upon the known performance limitations of the threat aircraft, its fire control system, its missiles and the competence of its pilot. A key factor is the capability of the defending aircraft's Radar Homing and Warning (RHAW) system and the pilot's visual awareness. The threat must be denied a favourable launch aspect and always offered a maximum LOS rate to hinder acquisition of the defending aircraft by the threat's fire control system. LTV YA-7F Corsair II prototype in flight. LTV have proposed the A-7 Plus, a stretched A-7 with an afterburning 25,0001b class fan, as the USAF's interim Close Air Support aircraft replacing the vulnerable A-10A. Modern CAS aircraft such as the Su-25 Frogfoot possess a 1:1 class combat thrust/weight ratio offering the acceleration and turn rates needed to counter battlefield SAMs. Once a launch has occurred early and accurate warning is vital to success. While RHAW systems can accurately identify the threat and its direction, they cannot indicate rate of closure and usually will not detect heatseekers. SAM launches are usually easy to detect visually, as large dust and smoke clouds are created and boosters tend to have large and bright exhaust plumes; similarly most AAMs will generate visible plumes while accelerating. In this context, it is worth noting that flying above an undercast over SAM infested territory is asking to get hit, as many US aircrew learned the hard way over North Vietnam. A SAM call or RHAW warning must be treated seriously and imminent impact by an unknown missile must be assumed. The initial defensive manoeuvre should be a hard break turn while deploying flares, chaff and throttling back. This will increase the LOS rate relative to the incoming missile which can affect tracking, while also changing aspect which introduces jitter and rotates the tailpipe away from a six o'clock threat. Attaining beam aspect relative to the missile can be most effective when dealing with Doppler radar guided missiles at lower altitudes, as the resulting rapid drop in Doppler can and often does result in lock being broken. Fuse performance may also be degraded. Turning to beam aspect should allow visual acquisition and tracking of the incoming missile, particularly if fired from six o'clock. It is important that tactical aircraft maintain high airspeed over hostile territory, preferably above vc (v, - corner speed = minimum speed at which maximum load factor (G) may be attained) to allow the application of maximum G when under attack. A good rule of thumb quoted [1 ] is that a missile must pull at least five times the G-load of its target for a successful interception, therefore an aircraft maximises its chances of survival by maintaining a high energy state. Good thrust/weight ratio and turn rate are not lost under these circumstances, getting caught at low airspeeds has often proved to be fatal. The direction of the break turn is dependent upon the aspect from which the missile is approaching, the objective always being to attain beam aspect relative to the missile. Breaking downward can force a radar guided missile to look down into clutter, while breaking into the sun or clouds can saturate a heat seeker's detector with background infra-red. If beam aspect is attained before the missile closes, it may not be advantageous to continue the turn and the best alternative can be an out-of-plane turn which maintains beam aspect and a high LOS rate while also maximising the rate at which the aircraft's aspect relative to the missile changes. If the threat is an AAM launched at substantial range and acquired visually at an early stage, a useful tactic may be to unload and dive away from the missile at full throttle to outrun it or outlast its engine. Visual contact should be maintained to allow a break turn if the missile can keep up. Early visual acquisition in aerial combat is most useful as the launch vehicle, smoke plume/contrails can identify the weapon, while the launch aspect alone may betray its capabilities. Visual tracking should be used to identify the plane of attack which can be exploited with an in-plane break turn to maximise the LOS rate. 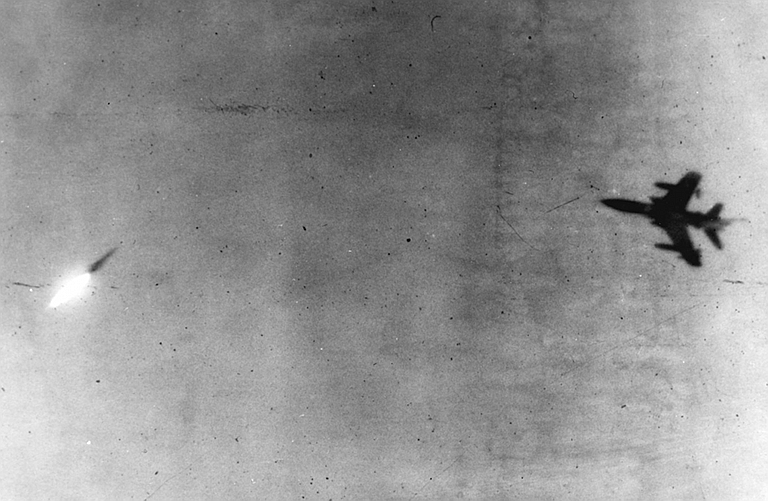 The missile's trajectory may also serve to identify it. A CLOS or beam rider will appear to superimpose itself upon the LOS to the launch platform/site, whereas a proportional nav weapon will tend to stabilise its position relative to the distant horizon. If an AAM is launched from the forward quarter at close range, time may not be available to attain beam aspect and other measures must be taken. Breaking toward the AAM may require a large correction which the guidance cannot carry out at the high closure rate. If the missile does correct, rapid reversal of the turn may cause overshoot or exceed the seeker's tracking rate limit as it attempts to follow the LOS. A light dogfight missile may not be outmanoeuvred by this tactic. While SAMs and AAMs represent a serious threat to combat aircraft, they can be defeated by appropriate countermeasures and manoeuvring. This perception is reflected in the USAF's current CAS/Battlefield Air Interdiction (CAS/BAI) programme which is aimed at replacing the A-10 CAS aircraft with a more agile successor. This situation is the result of the Russian's deployment of systems such as the SA-8, SA-9, SA-11 and SA-13 all of which carry radar sets on each launcher. The increase in the number of emitters to be jammed reduces the effectiveness of airborne ECM and results in a need for higher agility to avoid tracking and to outmanoeuvre launched weapons. While the A-10A is accurate, robust and has a relatively low heat signature, it is also very large, has a poor thrust/weight ratio and is rather slow with a combat speed around 350kt. While the US Army is delighted with the aircraft, TAC are unhappy about its survivability in an environment saturated with radar guided SAMs and shootdown AAMs and thus want a replacement [Editor's Note 2005: this is the beginning of the development effort which led to the JSF program a decade later]. Interestingly, it indicates a away from the Shturmovik philosophy of CAS toward the Typhoon philosophy, ie. use an aircraft which is agile enough to fend for itself in hostile airspace. The leading contenders in the CAS/BAI programme (at the time of writing) were the A-16 and a modified A-7D, the latter preferred for its lower cost. 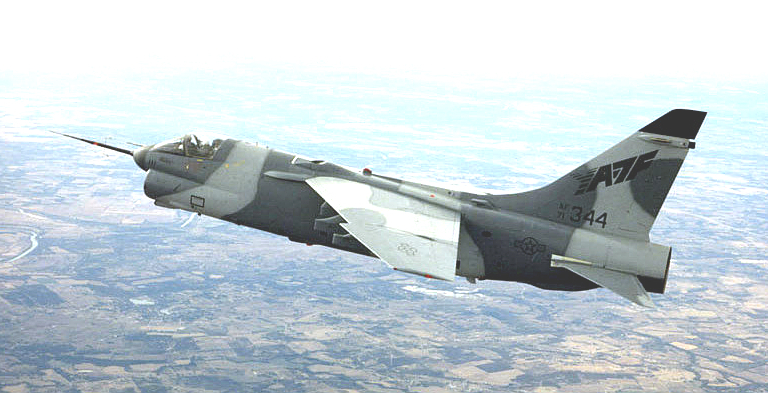 The A-7 Plus aircraft would be rebuilt from existing airframes. The 15,000 lb thrust TF41A-1 fan would be supplanted by either an F-110 or F-100-220 25,000 lb class afterburning fan and a 48" fuselage stretch carried out to accommodate the new engine. The wing would receive trailing edge flap augmenters, lift dumping spoilers and, significantly, leading edge strakes to improve turn rate. Flir night vision equipment and terrain following radar would be carried, with some additional fuel against the earlier A-7D. The new engine will allow mildly supersonic speed but should vastly improve acceleration and sustained turn rate by virtue of nearly 1:1 combat thrust/weight ratio, much improved over the A-7D at about 0.6:1. The aircraft's high subsonic penetration speed, improved manoeuvr ability and demonstrated good low level handling should provide a quantum leap in survivability against the lumbering A-10. The other contender, the A-16 which is essentially a reduced capability F-16C offers even better manoeuvre performance but at a greater cost. Guided missiles are a threat which can be countered, but success demands awareness both in planning and execution. Shaw R.L., 'Fighter Combat, Tactics and Manoeuvring', Naval Institute Press, 1985. Nordeen L.O., 'Air Warfare in the Missile Age', A&AP, 1985. Editor's Note 2005: the advent of 4th Generation AAMs and 'double digit' SAMs has effectively eroded much of what could be achieved by using manoeuvre techniques. Nevertheless they remain effective against many legacy weapons and MANPADS, providing the aircraft has the required performance capabilities - kinematics do still matter.